It’s almost the end of July and I’ve all but given up on our garden this year. The climate here in Ventura is something else. It’s mild and sunny one day, freezing cold the next and overcast and humid the next. The garden seems to be reflecting the strange weather patterns with a lackluster production. 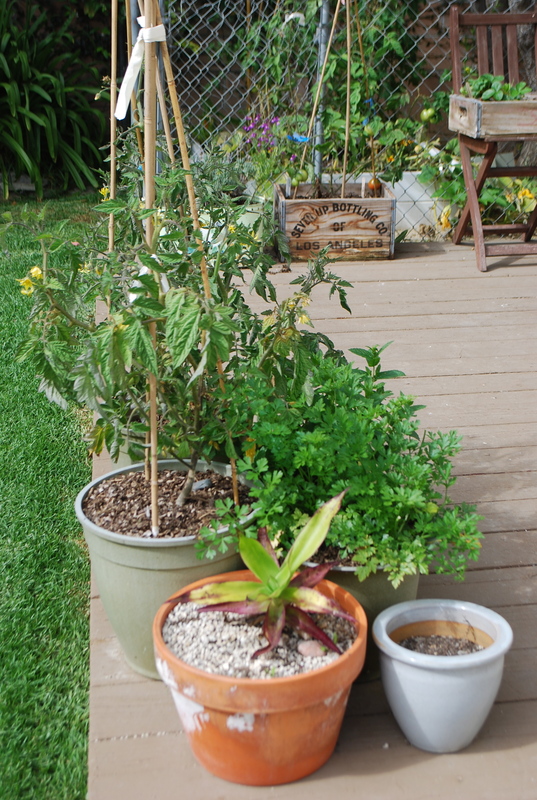 In Orange County’s blistering summer heat, we were seeing lots of tomatoes by this time and my container garden was looking lush and full. Things are growing here but very, very slowly. 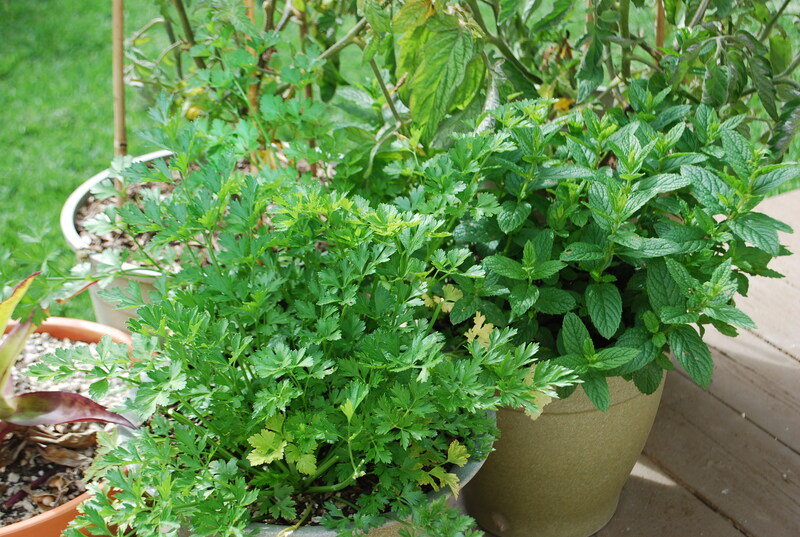 The mint and parsley are finally doing well. We are catching little caterpillars chewing through some of the mint, but it’s made a recovery since I planted it a few months back. Our Black Pear Tomato. The only tomato plant that seems to be doing anything. This is the first tomato that’s ripening, ever so slowly. The strawberries are not doing much, sadly. We have gotten one nice-sized strawberry from these plants and that was that. 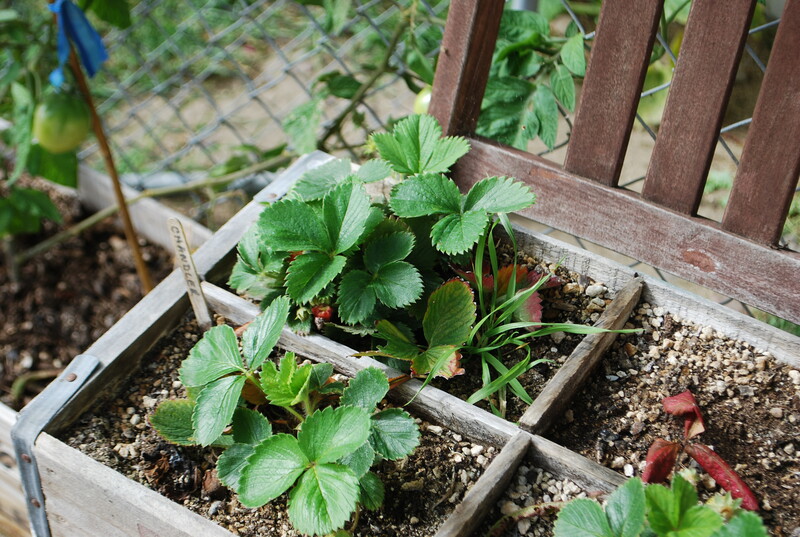 I’ve noticed strawberries will grow for a few days and then wilt up. Not sure what’s happening but I’m very disappointed in our little strawberry box. (It also looks as if it needs some weeding). The question of the day… is this a cucumber or a squash? I seem to think we planted squash here but Jeff thinks this is a cucumber. It looks a little bit like both? 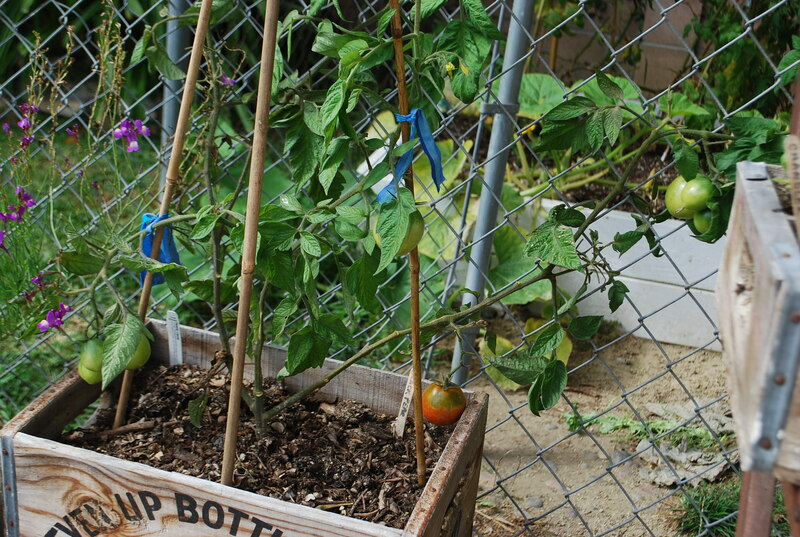 Seasoned gardeners, please tell us what we have growing? We have pumpkins in the box vineing all over the place and one little pumpkin has started growing too, which is exciting. But, we are fighting this strange yellow fungus (?) on some of the leaves. We’ve been cutting back yellowed leaves and spraying the others with an organic copper spray. It doesn’t seem to be working. Hoping this pumpkin continues to grow. The hops are growing rapidly and probably the best out of everything in the garden. They are beautiful, green and viney and I love watching Jeff tend to them every day. Jeff pointed out a fresh cone growing off of one of the vines. He’s pretty excited and I am too. At least there is some good news in the garden. I have to keep in mind that gardening is always a learning process. You win some, you lose some. You try again next year. This is our first year in a new climate and the first year growing in a raised bed. Next year I will plan better and hopefully have a helper in Ellie who seems eager already to get her hands in the dirt. 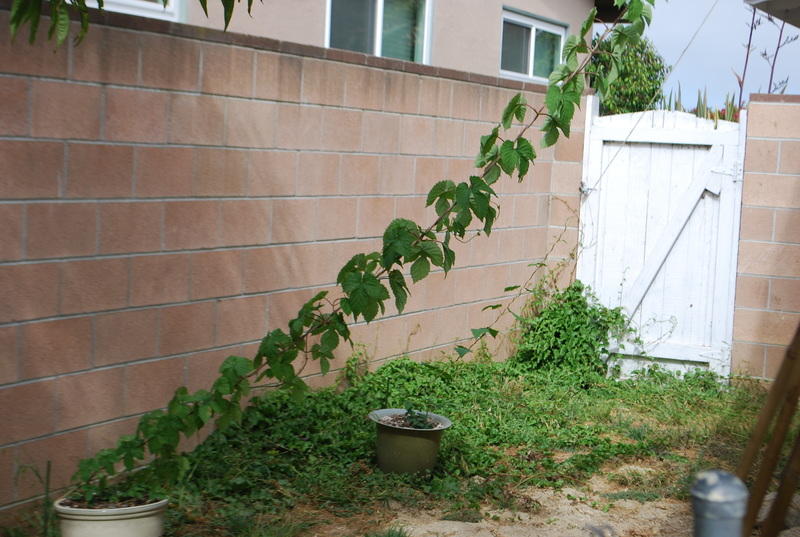 This entry was posted in gardening and tagged gardening on the California coast, growing backyard hops, july garden. Bookmark the permalink. Looks like a zucchini to me, for sure. 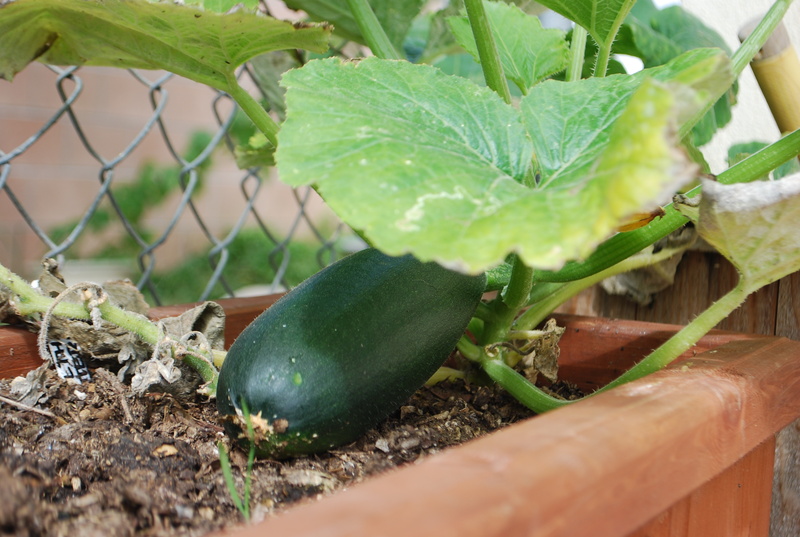 zucchini is a bush plant, not a sprawling one, so that is one way to tell. 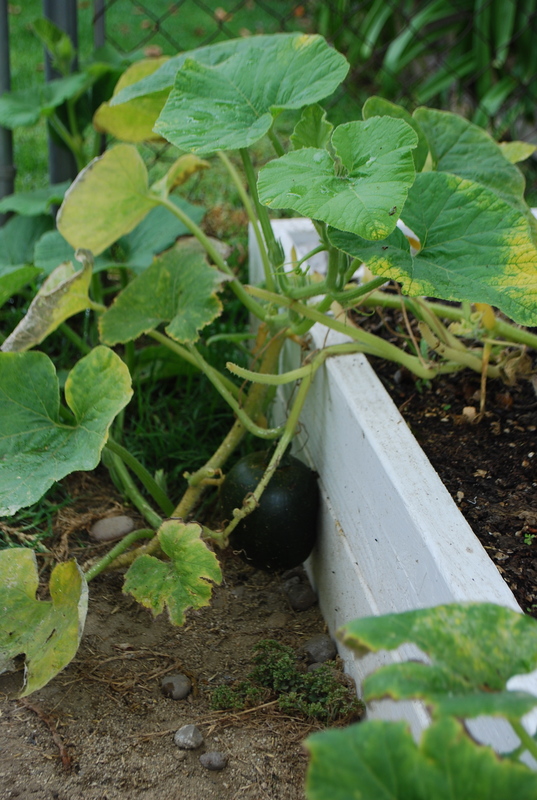 there are many darker varieties of cukes, even some yellow ones, so it could be a cucumber or winter squash..
do you remember what squash plants you planted? 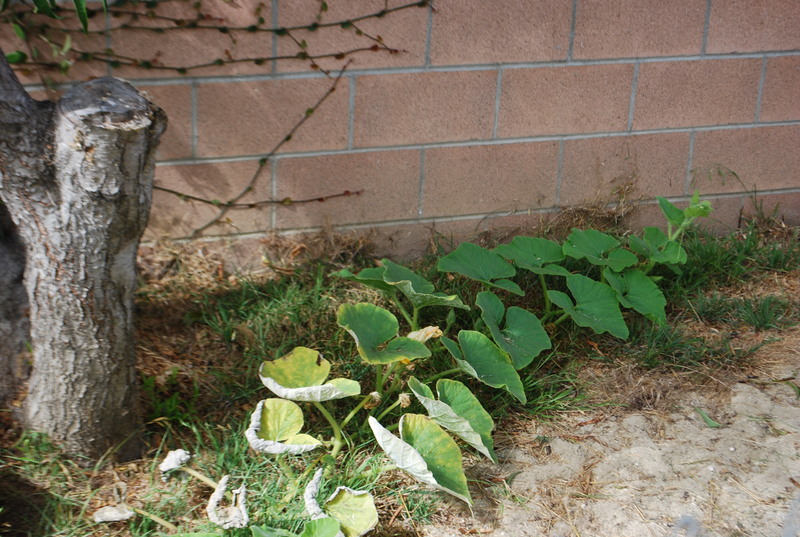 cucumbers and most winter squash plants sprawl. also did your nail lightly in it, if it cuts easily it is more like a cuke, a winter squash will get a harder and harder skin as the season goes on.